This product is no longer available and has been replaced by: 05103. Some accessories, replacement parts, or services may still be available. The 05103, manufactured by R. M. Young, measures wind speed with a helicoid-shaped, four-blade propeller. Wind direction is sensed by the orientation of the fuselage-shaped sensor body, which is connected to an internal potentiometer. 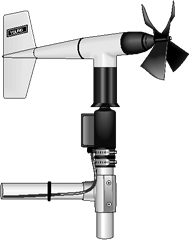 The 05103 Wind Monitor is made out of rigid UV-stabilized thermoplastic with stainless steel and anodized aluminum fittings. The thermoplastic material resists corrosion from sea air environments and atmospheric pollutants. It uses stainless-steel precision-grade ball bearings for the propeller shaft and vertical shaft bearings. The 05103 measures wind speed with a helicoid-shaped, four-blade propeller. Rotation of the propeller produces an ac sine wave that has a frequency directly proportional to wind speed. The ac signal is induced in a transducer coil by a six-pole magnet mounted on the propeller shaft. The coil resides on the non-rotating central portion of the main mounting assembly, eliminating the need for slip rings and brushes. Wind direction is sensed by the orientation of the fuselage-shaped sensor body, which is connected to an internal potentiometer. The datalogger applies a known precision excitation voltage to the potentiometer element. The output is an analog voltage signal directly proportional to the azimuth angle.